Back in 1998, Long Term Capital Management, the most famous hedge fund on the planet, blew up and nearly took all of Wall Street down with it. It was pretty spectacular. But what was even more spectacular was what happened next: less than a year after LTCM’s collapse, its founder, John Meriwether, started up a new fund. And people invested in it! Well, fine. It was a more innocent time, after all, and there were people who really believed that LTCM had just run into a once-in-a-century spell of bad luck. Can’t blame a guy for that. But last year Meriwether’s new fund went belly up too. So that’s twice. He must really be a pariah now, right? Right? 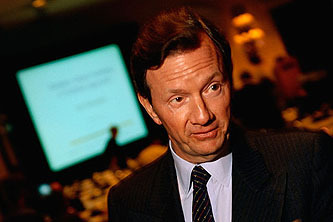 Hedge fund manager and arbitrageur, John Meriwether, is setting up his third fund, The Financial Times reported. The man behind Long-Term Capital Management is making the move just three months after he chose to close his second fund manager, JWM Partners. JWM Partners closed last year after losing 44% amidst the market turmoil of 2008. Hedge funds typically have “high water marks” which means that investors don’t pay performance fees to the fund manager in subsequent years unless the fund surpasses its highest point. Thus, the solution for fund managers whenever they have a bad year is to liquidate, wait a bit, and form a new fund?!?! Anyone who was invested in the old fund and the new fund thus pays fees twice: you paid when JWM Partners reached its high water mark, and now you’ll pay again if/when Meriweather Cubed (not the real name) manages to make money — the same money JWM Partners effectively lost after reaching its high water mark. Damn. Words fail. Via Felix Salmon.